One of the lesser-remembered 80s Australian computer games magazines is PC Games. At least, I assume it’s lesser-remembered because it doesn’t seem to have a Wikipedia entry, although its UK cousin does. PC in those days simply meant personal computer, not necessarily the IBM/Microsoft platform it does today. Australian PC Games ran for, I think, perhaps about two years in the mid-80s, during the boom of 8-bit personal computers. It was put out by the same publisher as Australian Personal Computer, which is still around, but had more of a games focus. 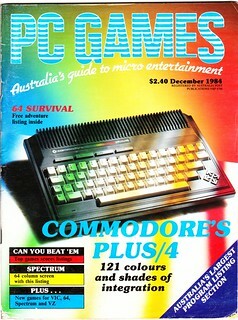 Apart from games reviews and tips, it also had features and reviews of new microcomputers — at the time, 8-bit computers such as the Commodore 64 were incredibly popular, and the likes of the Atari ST and Amiga were just starting to appear on the scene. The magazine also had games listings — something unheard of these days (thanks to cover discs and the Internet), they’d print program code in the magazine for readers to type in. Apart from games they also had a running series called PCG-64, which was machine-code listings of BASIC language enhancements for the Commodore 64, many of them sent in by readers. I’m only reminded of PC Games because the Retrogaming AUS web site has started up a Wiki which has a page on it. To my lasting regret, at some stage in the 90s I cleared out almost all of my copies of PC Games, except for one: December 1984. 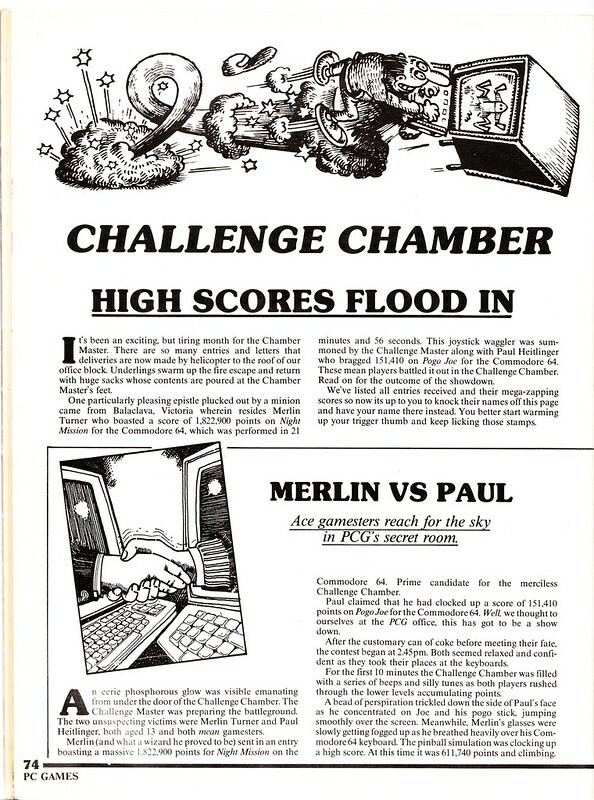 One of the regular features in PCG was the Challenge Chamber. 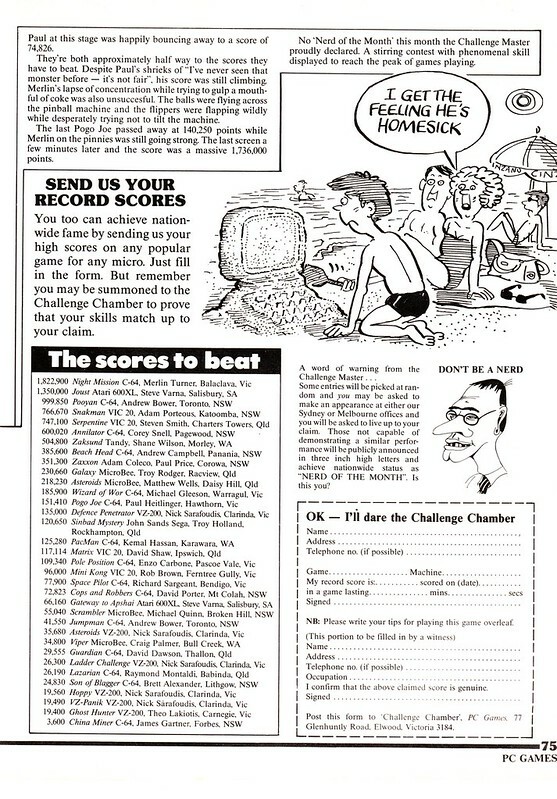 People could send in their high scores in various games for listing in the magazine, and PCG would periodically call in some of them to play in their “Challenge Chamber”… just to make sure they were as good as they claimed. My friend Merlin sent in a dizzyingly high score for the Commodore 64 pinball game Night Mission, and one Saturday in late-1984, PCG got him and another 13 year-old called Paul (who was a whiz at Pogo Joe) to come in and play. It turned out the PCG Challenge Chamber (the Melbourne version at least) was a magazine office next to Elwood Post Office — and just down the street from my house. I managed to invite myself along and watch the challenge unfold.